I love this idea! I'm so jealous of those windows, it's crazy! Now I'm headed over to the bench post! I love the window Diana. I too have one hung on my wall in my dining area, only a nine panel one. I love the size of yours and I love that you painted it black, I never even considered that for ours. I came across ours a couple of years ago, and just sanded it and white washed it to show it's character. My hubby replaced two of the glass panes that were broken. Great spot to show yours off. I love the way the window turned out! I feel like I'm always coming across neat old things, but then have no idea what to do with them- so I've been anxiously awaiting this post, just to see what you did with your find. I love this! I love that ...love your blog and your taste. LOVE LOVE LOVE! 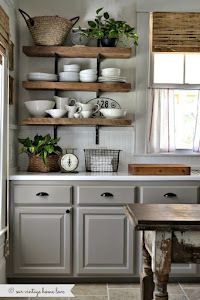 Looks so great- I'm totally stealing your idea and doing this in my home, too! And I love the color- the black looks really sharp. It's gorgeous and your living room looks like a cozy room...but where is the TV?! I don't think I've seen or read about it on your blog! I like the simplicity of the black painted window just as it is with all your weathered wood pieces. Your room is arranged to perfection! I have several old windows, but would love to find a large one like yours to hang over our living room sofa. I love everything about that room! That window is spectacular! I was looking for the post on bread boards (place setting size) that had numbers (black) stamped/painted on them. I was looking in Sept 2011. Is that the right month or does another post ring a bell? Having some breadboard art done and wanted a visual of a font so I can make a decision. Thanks. what materials did you use to hang your window? we have a large paned widow in our kitchen and i love it, it was quite the challenge to hang it, but how it turned out!! I also love your window. I like your idea of hanging it on the wall, and making it as ornamental accessory for the living room. It’s the simplicity of the black frame that made it stunning and elegant. Your creative idea has proven that even an ordinary window can be the center of attention in the living room. Perfect place for it! You did a great job finishing it...as usual. :-) The shelf is great too. I love the touches of orange in that area! The pillow fabric is perfect too. Overall, stunning! oh you must just love it!! the pillow fabric and the bench are such a great contact...good for you!! we take bike rides at night too! What a find! It looks great there. Awesome find and placement! Its so beautiful! I'm trying to view the rustic bench post but says error? Is this just me? I've been thinking about this ever since you posted it. It really is beautiful! I've been drawn to and using old windows since the 70s, with or without the glass in them. I had an idea you might like to consider for this window of yours, or another one later on. You can use the window as a multi-picture frame, putting a photo in each window cell. In a larger window, like you have, if you don't want to put a picture in each cell, you can put just a few in a pattern: a single line across the middle, or a checkerboard pattern. You get the idea, I'm sure. Hope this idea gives you some ideas! Do you have slipcovers?? If so any you would recommend?? Great blog... I had a suggestion regarding the shelf and the L brackets. I recently did the same thing with a shelf I put up.... however I put the L brackets on the top instead of underneath. Then, I carefully selected objects which can go over the brackets to hide them. They are completely invisible now and the shelf looks like it is floating.